Interested?!? 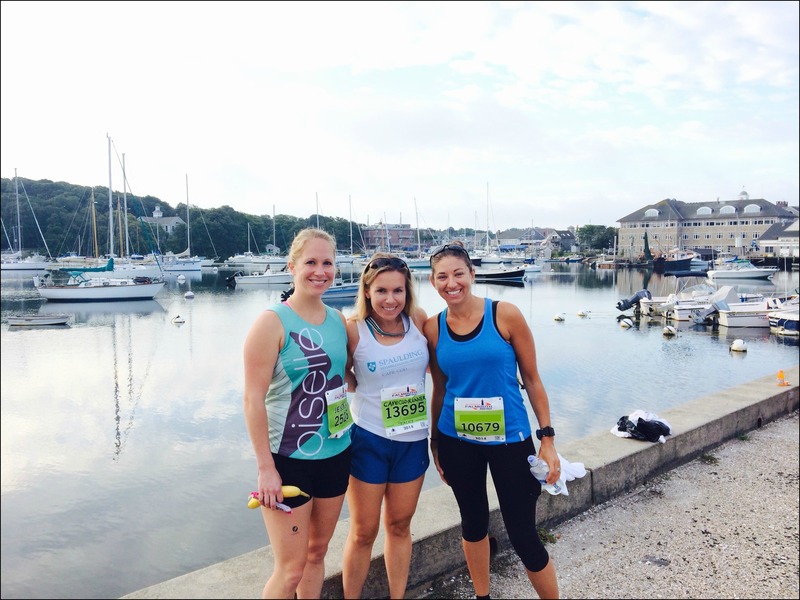 I LOVED the Falmouth Road Race when I did it last year and was really disappointed when I didn’t get in through the lottery this year – I’ll take it! I headed to the expo Friday night to pick up my bib and race swag. 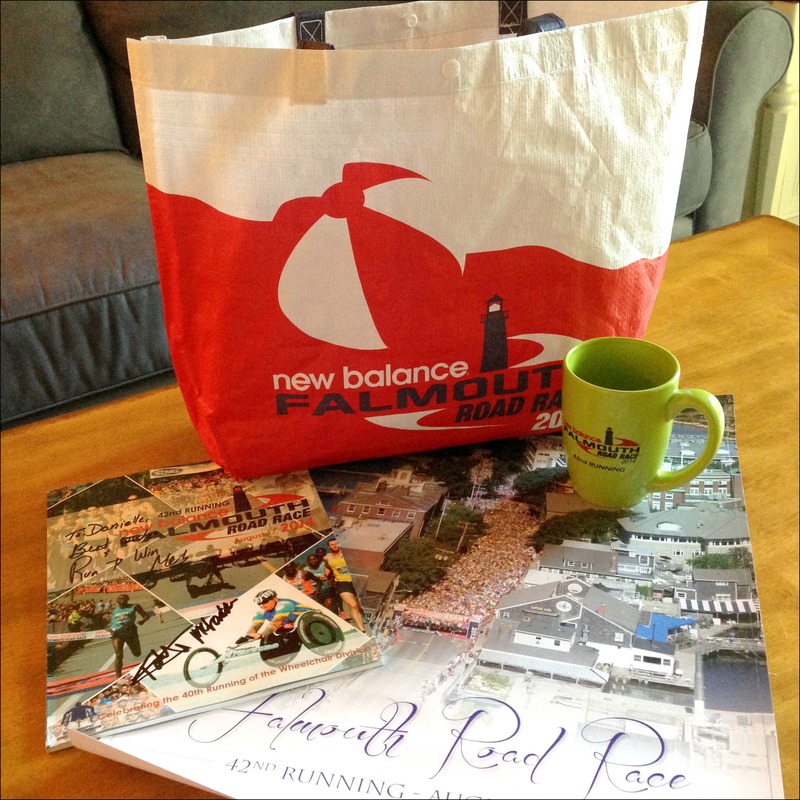 I honestly think the Falmouth Road Race does the best swag – we got a really nice program, a race poster and coffee mug all in a reusable tote bag! I MUCH prefer a coffee mug to a t-shirt that I’ll never wear! Since I hadn’t been planning on running the race I hadn’t looked into the details much. I knew Meb Keflezighi (2014 Boston Marathon winner!) was scheduled to be at the race, but when I saw he was going to be speaking at the expo the next day I decided it would be worth a trip back! Meb & Boston Marathon race director Dave McGillivray spoke for about 45 minutes, it was funny, interesting and inspirational and I’m so glad I went! Afterwards Meb was more than happy to take photos and sign autographs (and I bought his book which I can’t wait to start reading!). Race morning I met Stacey and her friend Jess to get on a bus to the race start. 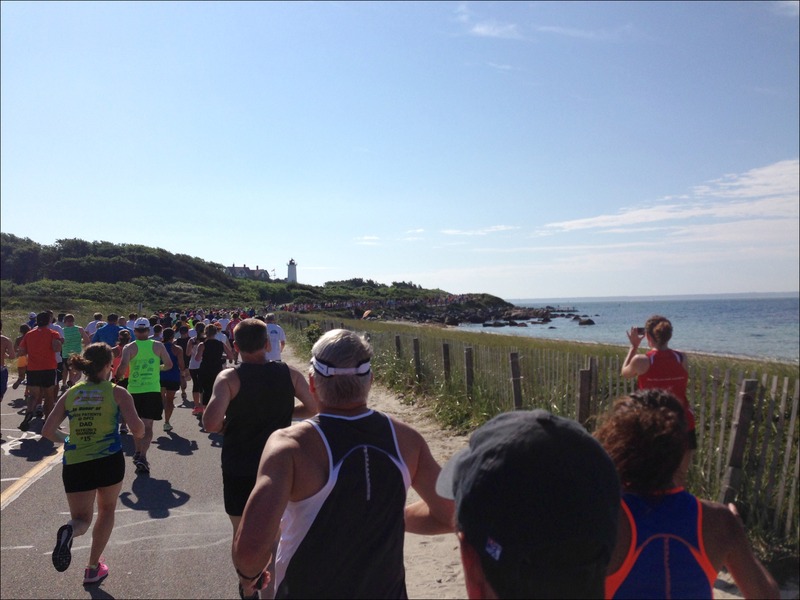 It’s amazing to me how they can transport and fit 13,000 runners into tiny little Woods Hole! We were nice and early, so we had about an hour and a half to hangout with runner friends, hydrate and make multiple porta-potty trips before the 9am start. 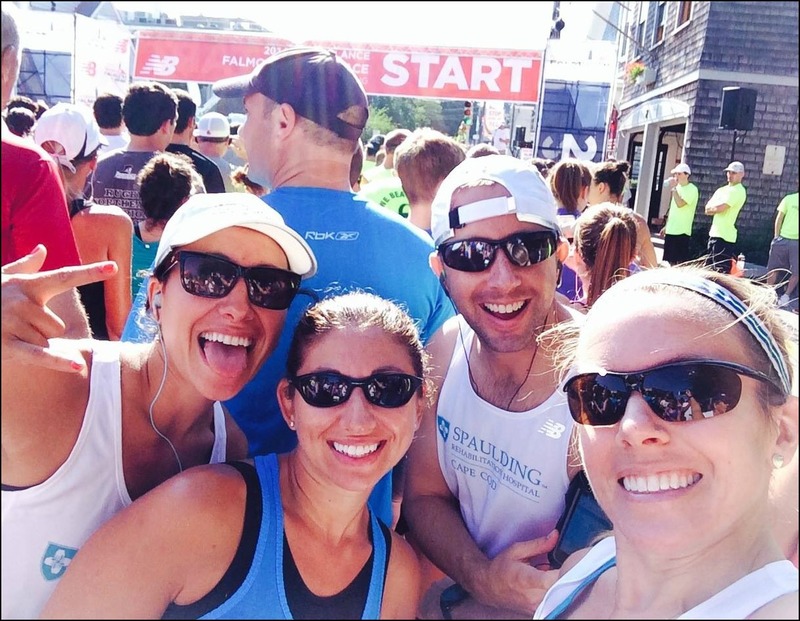 We decided that once we crossed the starting line we’d all run our own race since we all had slightly different goals. Since I normally only run 3 times a week and had already run 4 times this week I wasn’t quite sure what to expect from my legs, but ideally, if my legs felt ok, my goal was to beat my time from last year (it’s a 7 mile race and my time last year was 1:05:56). The views along this course are gorgeous (there’s a reason this “small town” 7 mile race has a lottery!) and I couldn’t resist pulling out my phone for a few pictures! 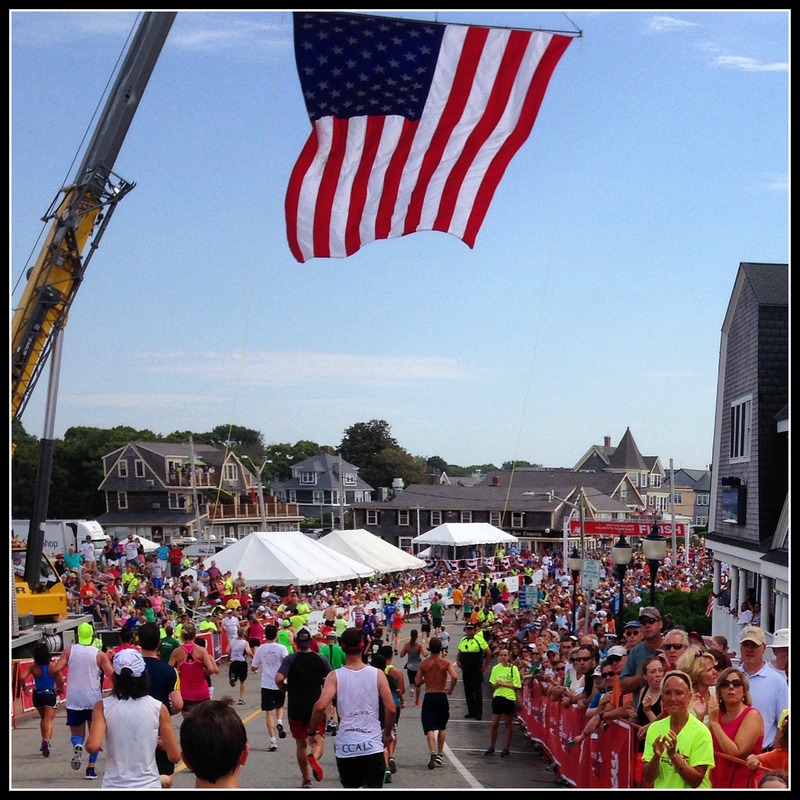 Now here’s the thing about the Falmouth Road Race, it’s traditionally held on the hottest day of the summer. Yup. I have no idea how they manage it, but oh my goodness it’s SOOOO hot every year (and so hard to resist just running and jumping IN the water instead of running by it!). One of the nice things about this race (other than the views!) is the crowd support! 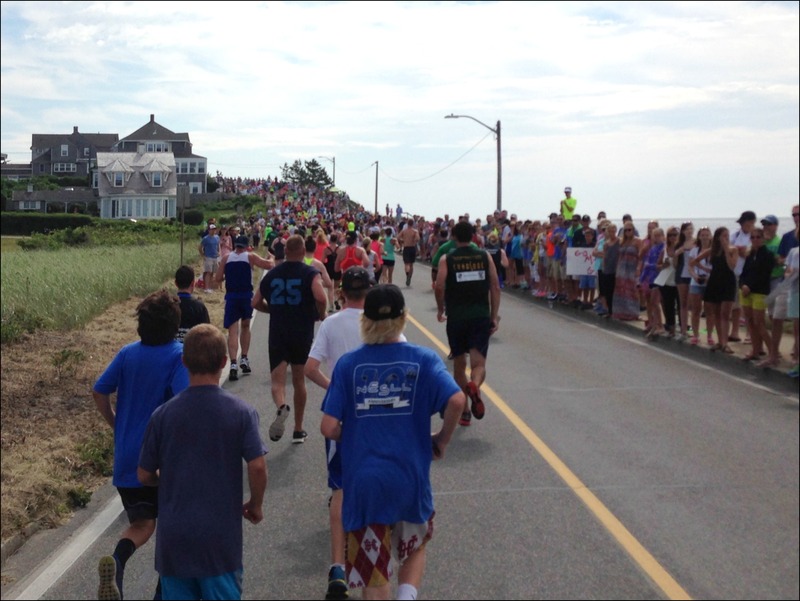 I’m pretty sure all of Falmouth comes out to cheer on the runners, set up their own water stations and stand on their front lawns with hoses ready to spray anyone who wants to be cooled down (and let me tell you I ran through EVERY hose – I was soaked by the end of the race!). 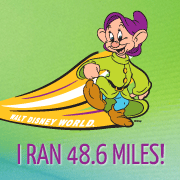 Despite running on tired legs I felt pretty good most of the race and was on pace to beat my time from last year (even with a quick porta-potty stop around mile 4…guess I hydrated a bit too much!). As I turned the corner for the last climb to the finish I briefly reminisced about my experience on the hill last year (you can read about it HERE, but long story short the heat and the push up the hill got to me and I took a brief stop to lose the large ice coffee I had before the race…). Hill to the finish! Check out all that crowd support! This time I made it up the hill…and kept going! As you come over the hill the view is just amazing, an enormous American flag over the finish line along the beach and spectators all around. Somehow shortly after the finish line the group of us that started together all found each other – we had all finished within about 5 minutes! My final time was 1:03:43, a 2 minute 13 second PR over last year! 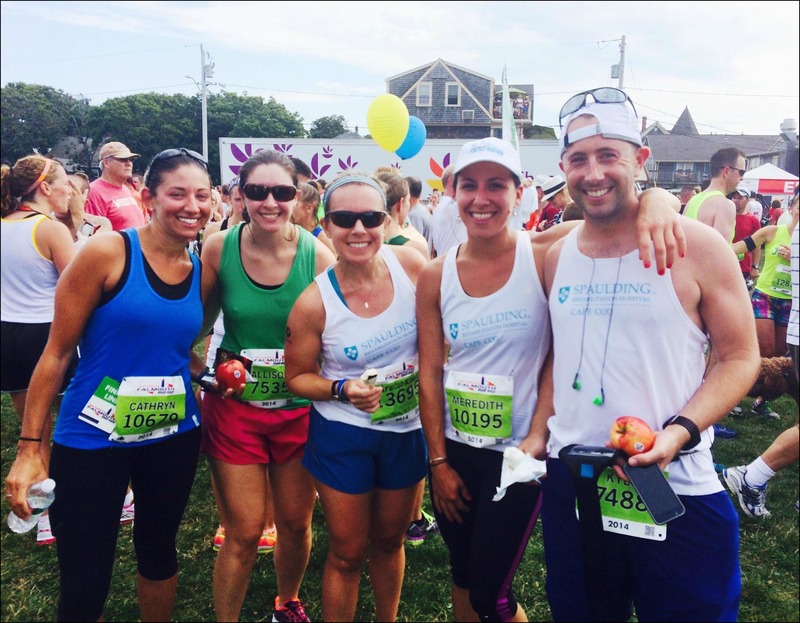 I really do love this race, I can’t recommend it enough to anyone interested in visiting Cape Cod – I’ll definitely be entering the lottery next year (fingers crossed!). How would you feel about a race mug vs. shirt? What’s the most scenic race you’ve ever done? I can’t wait till you come up and do a race on Cape Cod either! I think most of us have piles of race shirts. I’ve done a few races where a hat was an option, and I’ve taken it. 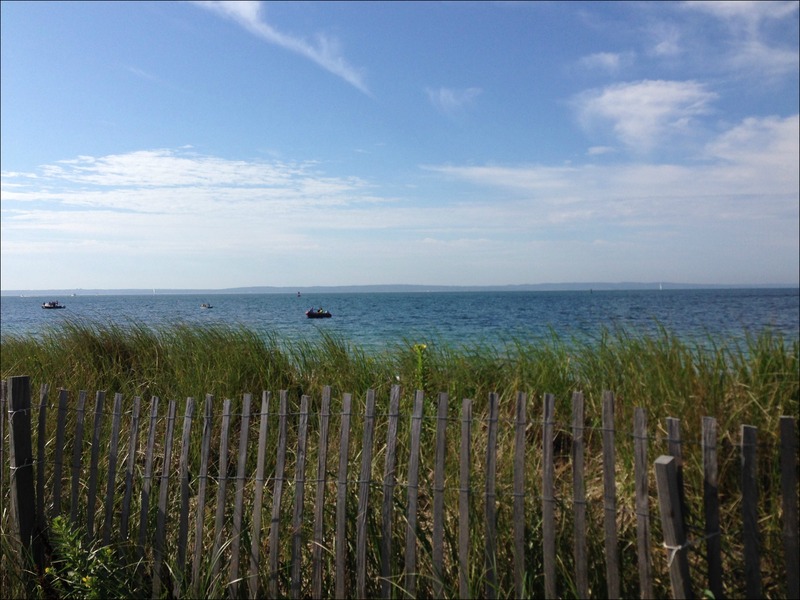 The Half at the Hamptons and Smuttynose races go through woods, fields and along the NH coast. You get to see a bit of everything. Oh I’ve heard those races are great, I’ll have to put them on my to-do list! Oh I’d love a mug. I hardly ever wear t shirts but I drink my coffee daily!! Exactly! I love using mugs from different trips and events every morning, it’s such a nice way to remember them! It all depends on the material and tech of the t-shirt, but I know I could always use a mug. I love hot chocolate during the winter and I don’t seem to have enough mugs. Looks like a beautiful race course! That’s awesome, congrats!!! What a cool race. And so cool to meet Meb. Looks amazing. I think the Flying Pirate Half I ran last year in OBX was the most scenic I’ve run. Oh I’ve always wanted to visit OBX, I hear it’s gorgeous! I may have to add a race there to my “to-do” list! Congrats on your PR! This always looks like such a fun race. 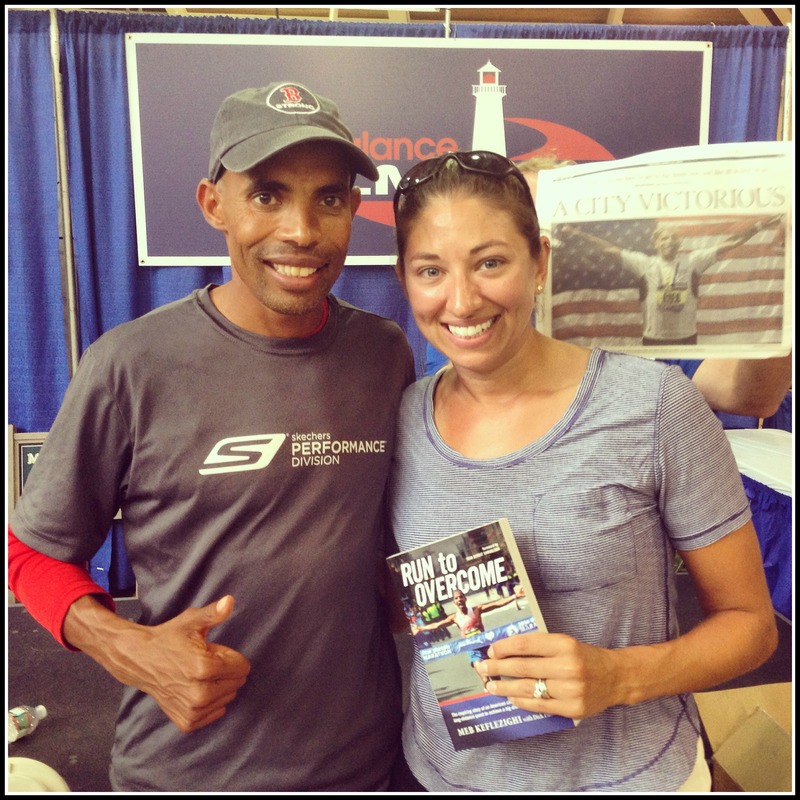 And awesome pic with Meb too! I’d love to get just about anything other than a shirt–mug, visor, you name it. Great swag bag. The most scenic race I’ve done is either the Kauai Half Marathon or Wild Dog Triathlon in RI. I loves me some water views! I agree, there’s nothing like running by the water (and it usually means a breeze too!). I can’t believe how time flies!! I feel like I just read about you running this last year and here you are doing it again…crazy. Congrats on the PR. This race looks so beautiful! Thanks, it really is a gorgeous race and I agree, I feel like it was so recently that I wrote my last post about this race! Congrats on the PR and running a great race! Everyone I know who’s run Falmouth loves it, and hopefully someday I’ll get lucky in the lottery and get to try it myself! 🙂 So awesome you got to meet Meb too. I like the idea of a mug instead of a shirt. I have way too many shirts, but I also have way too many mugs! It would be a souvenir I’d use more than a shirt, though. And I love the tote bag! Haha, I definitely also have WAY too many mugs since I usually collect them whenever I’m traveling, but I love opening my cabinet each morning and choosing one to remind me of a trip or race! Awesome sauce on the PR! And I love the cat photo bomb! Haha, so I just had to scroll back and see what cat you meant…do you mean the photo of us in front of the water?? I think that’s a pile of clothes! Haha! OMG that is TOO funny! I think my contacts were in backwards. Again. LOL! Nice job on the PR Danielle. My sisters both ran this race about 30 years ago. I would love to run it someday despite the heat.